That was Ok, if a bit tight on the two convention bridge sections that connect to the floating part. 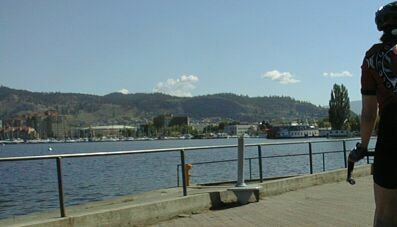 Then we took a lovely bike path (which heads to the right as you come off the bridge) under 97 and along the harbor into downtown Kelowna. Finally we rode east on city streets to eventually connect to CA 97. We had a bit of a delay when a piece of sharp metal did in both my rear Top Touring tire and the thorn proof tube in it. It slashed through the sidewalk of the tire and through the quarter inch thick tube,I thought that combination was indestructible! We walked our bikes four block or so to a good bike store and I bought a Specialized Nimbus EX to replace the TT 2000. 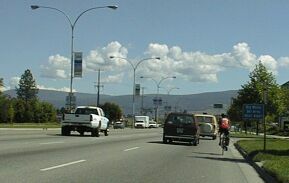 That was as close as I could come to a 700c touring tire in Kelowna. It is a 700x28 which is almost the same size as the Conti 700x32. With luck, it will be good for the rest of this tour. 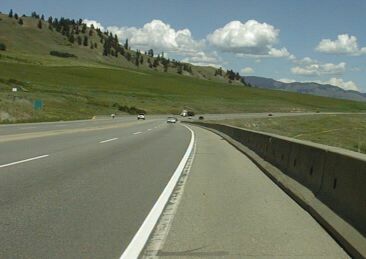 North of Winfield, CA 97 becomes two lanes with no shoulder or a very small shoulder. There is a moderate amount of traffic including big trucks, so this is not a section for timid riders. 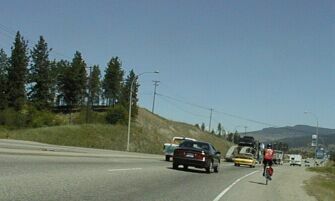 Still, traffic is slower and more polite than it would be on a similar road in the US, so it isn't a big deal: you just need to pay attention to the traffic coming up behind you and react in such a way as to avoid problems. Note that I had to do the same thing when we stopped for lunch in Winfield and a oblivious driver pulled out into my path in the shopping center where we ate a Subway. It is nice to ride without paying much attention, but better to adjust you level of attention to match the circumstances. It is also very nice to have a good mirror when riding on shoulder-less roads with traffic. 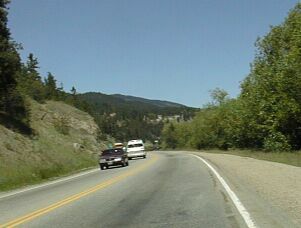 CA 97 turns back into a four lane highway with shoulders well before Vernon. 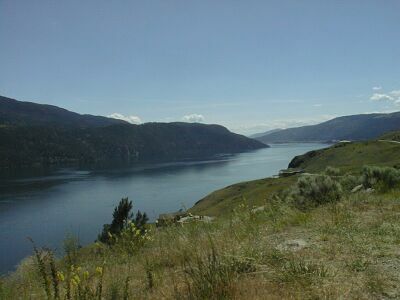 When you get to the Provincial Park south of Vernon - there are signs and you can see a large number of RV sites down by the lake , you can go down to the old highway and ride it instead on 97. Much nicer and it avoids a big hill Shortly after the old road rejoins CA 97, there is an intersection with signs for Coldstream. Turn left there and descend steeply down to the lake, then head east across the top of the lake. Very nice riding! 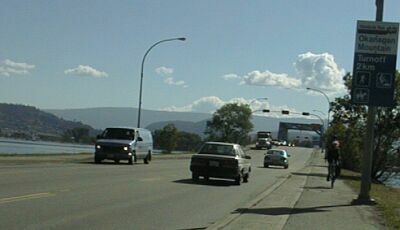 After the long, nice ride across the top of the lake, Kalmalka Rd intersects BC 6. 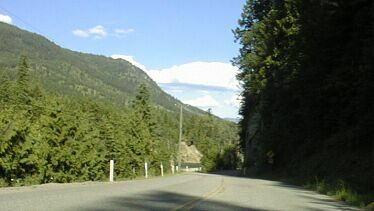 This is a two lane road with OK shoulders to Lumby. It was being re-paved today, but that only cost me a short wait. 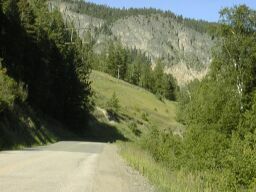 and then descends steeply (7% grade near the end) into another canyon. It was quite nice to change from grinding up a long hill in the hot sun to riding in shade alongside a river in a narrow canyon. 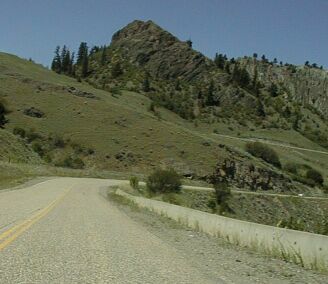 That canyon eventually widens and there is a nice flat, straight section that ends with several hills. 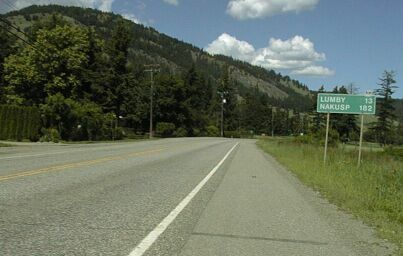 Eventually 6 turns south and begins to head up to Monashee Pass. When that happens, another road continues on 'into' Cherryville. There really isn't any one Cherryville, but just a bunch of parts of the town strung out along the road for half a dozen miles. About a mile down that road is a general store where I stopped for a snack and to ask about the two B+Bs located farther down the road. The I rode about 5.5 miles to the second B+B which is very beautiful and also very bicycle friendly. And, oh yes, it has an inter-net connection so I can upload this ride report / web page.